Whoa. The synopsis for this one had my attention months ago, ’cause it was obvious this story would lead us on an intense, yet uncomfortable path. Just the title alone says so much. I couldn’t wait!! And it delivered. Even when it took me out of my comfort-zone, made me cringe, it simultaneously made me ache. It has that real life feel, and I was in! In fact, the *cringeworthy* stuff often has that added bonus for me. Eeep! I know… sometimes I worry that I should stick to sweet and safe (lest I be labelled… a bad book-influence). 😉 And I do enjoy sweet and safe, but I like to delve into the socially… unacceptable. The books that make me uncomfortable (make me feel one thing, while my mind simultaneously chastises me) are how I get my mini-adrenaline-rushes. I love to agonize with the characters, and get all caught up in their passions, mistakes, repercussions and eventual growth. Their happiness, and peace. Hey if its not books, then it’s gonna be skydiving, so as long as the books are doing it for me, I think they’re safer. If I’m connecting to the story, my brain is really good at perceiving it as my “reality”, and I get realllly worked up. Fun! And this book was one of ’em! Maryse: Sara, I guess it is… women’s fiction? Sorta. I don’t know much about what constitutes that genre, but it IS about love (romantic love, family, friends, all of that), difficult decisions, personal need, priorities and real-life issues… but love is what it’s mostly all about. I mean it’s about a struggling marriage and a woman who, by chance, becomes friends with a reallllly handsome police officer, so you know… 😉 (but it’s not about “the police force” or anything like that). It’s not “traditional romance” but it is a love story… make no mistake about it. Nicole: Does it involve cheating? I was so wrecked after reading Arsen. Kandace: …so no shagging? is it just a bunch of girls sitting around drinking tea. Or is it more like a Jill Mansell book? 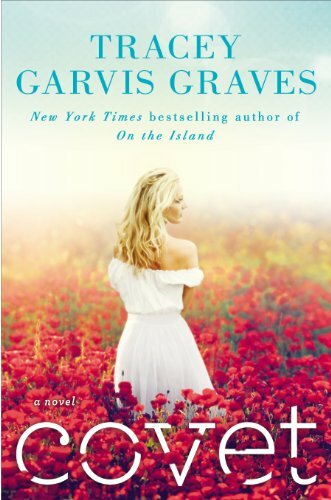 I knew it wasn’t considered “romance” along the lines of the author’s other novel “On The Island” (devastating circumstances + isolation between a “sort of” teacher and her student … oh that was soooooo good). While this one wasn’t that, it was something else that would make me squirm (and maybe even feel for her while I was squirming). We’re the Cantons. Sun-kissed, all-American, picture perfect. By all appearances, we’re the ideal suburban family. As long as you don’t look too closely. But I was worried this might be too much. I had just read a few along “these lines”, and here I was getting into yet, another one. I realize that these are not the thoughts of a happily married woman, but at the moment I am not very happily married. But you know what? She does it with taste. She handles the eeeeep-factor with care. Coveting is such a dirty word. And yet… Tracey let’s her characters live, love and grow the way they need to, even in their missteps. Claire and her husband, Chris, are having marriage difficulties as the stress of downsizing puts a damper on their “cushy” lifestyle. After losing his prestigious job, Claire’s husband is struggling to make ends meet. The worry of not being able to provide for his family is eating him alive (emasculating him in the process), so he takes on a high stress job that has him traveling all over the country every week. Even though Claire is having success with her own graphic design business, he refuses to accept her salary as the main-income in the family. I’m tired of talking about it – the recession, the horrible job market, Chris’s depression, and the resulting emotional upheaval that ripped through my household. I’m just done. Clare is lonely, and feeling dejected. Having lost that sense of intimacy with her husband (his mind is anywhere but “here” right now) their marriage is already so strained. And now that he is never home, she fears they will be too far gone by the time he feels he’s “caught up” in his professional life to slow down and catch up with their personal life. And in her time alone, she inadvertently makes a new friend (Daniel). A gorgeous police officer that pulls her over one day for a broken light… and they just seem to keep crossing paths. Two police officers are leaning up against a squad car, talking. The tall, dark-haired one looks familiar. “Remember that police officer that pulled me over for that taillight last month?” I ask. “The ridiculously good-looking one?” Elisa says. I keep thinking about the officer’s smile. Maybe it’s some kind of latent cop fantasy I don’t know I had. Maybe it’s because it’s been so long since my husband paid any attention to me at all. Maybe it’s because I’m so damn lonely. But married or not, Daniel can’t get her off his mind and finds himself “helping” her in various “innocent” ways. Even helps her get a graphic design job with his police station. And with all of this proximity and undeniable attraction… they really start connecting. Claire and I already knew better. And yet… there went the butterflies again. It looks as if he hasn’t shaved in a couple of days and the dark stubble that covers his face , and the worn jeans and long-sleeved gray t-shirt he’s wearing are a radical change from the clean-shaven, uniformed police officer I’m used to; he’s absolutely smoldering. Does it get crazy? Does it go there? Does it go too far? Do we get a happily ever after? Well… the secret is safe with me. But you know… somebody loses in this mess. Or do they all gain, in the end? Ahhhh see. That is the question, and this gently tumultous ride will get you there. Gently tumultuous? Yes, gently. Lingering, drawn out and almost hesitant in it’s approach. I loved the… “discovery” of it. We explore every thought and nuance that runs through the character’s heads. This isn’t so focused on the physical aspect of it (such as perhaps, a more torrid but all-out romance version of this). But it is about personal introspection, growth, acceptance and realizations. Inevitable change, and adapting with that change. What dreams were made of vs. what reality did to those dreams. Her husband, his goals and expectations of himself. Her friends, their lives, and how so many of them are closer in “personal conflict” then she ever realized. Life isn’t always, or maybe even ever… what we expect it to be. Sure, this book isn’t considered “romance” but I still took it in as a love story. I had butterflies, I had needs, I had wants, I had expectations, I had fears. I had angst, and confusion and this story lead me to each one of these feelings in full-force. Did the fact that it was more “gentle” in it’s approach keep me from all-out going crazy over this book? Maybe a little. And yet at the same time, done right, a book that deals with a socially apprehensible subject (whether it be Stockholm, teacher/student, love triangles and infidelity) when it takes me right out of my comfort zone and goes full-on “ouch”… well, that shock factor often “does it” for me. And yet, gentle or not, I fell hard for a certain character in the book. Thought about him for days after this and in fact, went on a search for romance books featuring police officers. I wanted the uniform and all of that “unapproachable and somewhat intimidating” appeal again. I wanted to discover the man behind the uniform, just so I could have that feeling again. …when he smiles at me and looks at me, all the nerve endings in my body start vibrating, as if he can generate an electric current by virtue of his expression and his proximity. Strange because until now I’ve never been one to swoon over a man in uniform. Ahhhhh that delicious flirting when you realize that the gorgeous officer with the no-nonsense, stoic appearance can actually be flirted with, without him arresting you for indecent behavior right after! Tee hee!! Heck I dunno. I’ve never done it (but I sure as heck noticed the swoon-worthy ones a time or two. Or three). 😉 And how exciting when the man behind the uniform might actually peek through for just a moment, to smile back. Hehe. All that to say that I really connected to this one. It might not have put me in a frenzy, but I read every single line and lived it, with her. I had a night of angst last night reading Arsen so can’t delve into this one right away. (oh but I loved it!) Hopefully it will go on sale soon. It was a bit pricey for kindle. Lucky duck you got sent a copy….at $10.99 I’m gonna have to hold my breath it goes on sale….like 80% off!!!!! Sad I want to read it NOW! Yes. I SO chase Travis. I just re-read Beautiful Disaster in fact, and had the SAME effect… SAME as intense… as in love… as swooney. After all of this time, I guess that proves for me —> that book, and HE is… my #1. Your comment about military men in uniform made me giggle…Army wife of 7 years here 🙂 I love a man in uniform, too 😉 Great review as always. It’s now on my wish list! Not sure if you will still read this Maryse since this review was a while ago but OMG. I don’t know how I missed this book, I loved On The Island and ended up buying it for 2 friends as gifts. So when I came across Covet at the library I couldn’t figure out how I knew the author at first. Anyway, I could not but this book down…I also couldn’t figure out if I liked it but I could not stop reading. As soon as I finished I needed to talk to someone about it so I looked to see if you read it (of course you did). Thank god because everything I was feeling, you felt the same. I was so torn (being married for 25 yrs) I shouldn’t be rooting for the cop (I loved him)!!! Thanks, as always you are the BEST.